I am not quite sure exactly how long I have been doing it. But it is likely since about 2011. 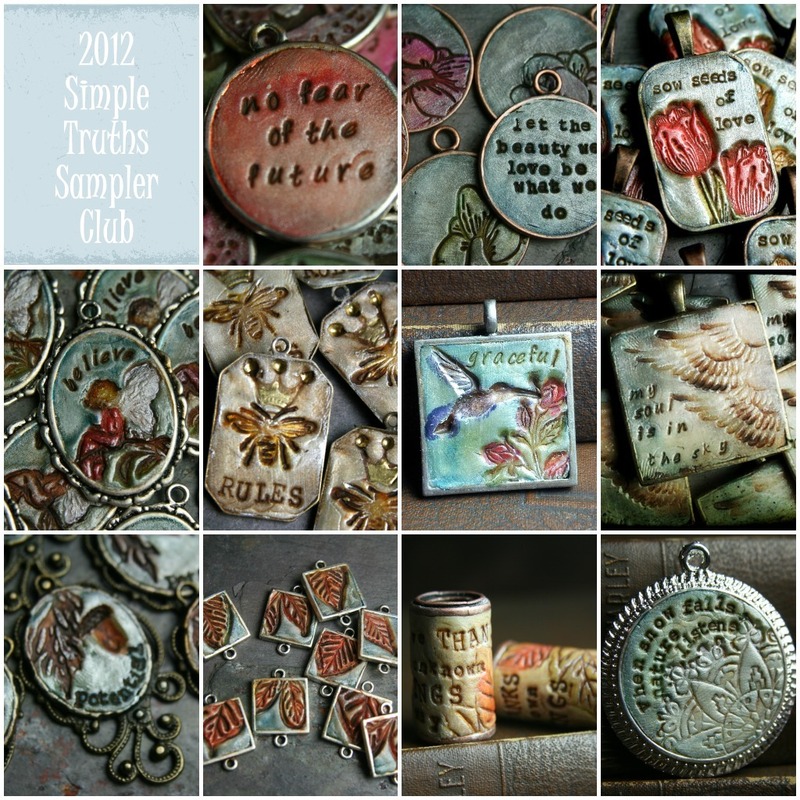 That was the year after I started making my Simple Truths components in polymer clay. I thought it would be fun to offer my followers a way to ensure that they got the newest pieces that I was creating, and it would also allow me to keep coming up with something new, while also using it as an excuse to teach myself new techniques. The idea was that I would make a limited edition pendant or component in a little surprise package delivered each month to members who select 3-, 6-, 9- or 12- month subscriptions. I called it the Simple Truths Sampler Club. For about a year or so I was just making something that spoke to me. Possibly seasonal or thematic. But I found that to be a hard thing for me to sustain because it seemed....lacking something special. Don't get me wrong... I love each little creation I make (I totally forgot about the Queen Bee Rules! ), and looking through these old pictures is like visiting with old friends (friends that I often wonder where they traveled to or what they became?). Some of them I even still make today because they have never gone out of style. This is one of the few Sampler pendants that I made (April 2014) that I still take custom orders for today. If you know me at all, you know that I absolutely have to have a meaningful message behind what I create. 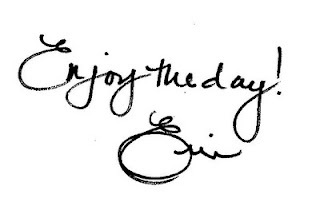 Often my creations have words, poems or song lyrics woven into them. Sometimes the image is enough. And then it hit me....each month I was writing and creating for the Art Bead Scene with the awesome art challenges and I truly loved those inspirations. They were the sole reason I started using art beads in the first place, and the way that I got into making my own. Why not use the monthly art as my Sampler Muse? Absolutely, an aha moment! In addition to the component, I started sending out a little letter to the members detailing the monthly challenge inspiration...my response to the inspiration...anything new that I learned along the way...and my process for creating something inspired by it. I have heard that they love these little letters. So I have decided that I will share this monthly missive with all of you so you can be privy to how I interpret the challenge theme each month. Welcome to my new series: Art Bead Evolutions. The pieces that I make are created first and foremost for the Club members. If there are more created in a limited run, or if I decide to offer them as a custom made-to-order piece, then they will be available in my shop. With the bleak landscape of winter around here it is easy to get stuck in a rut of doing neutrals or dark and moody monochromatic color schemes. At least it is for me. 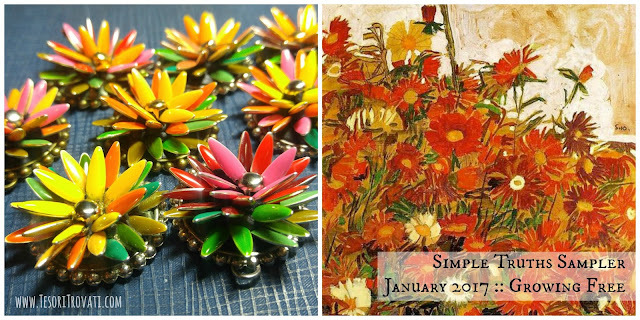 That is why I was so happy to see that the artwork for January was bright and full of vibrant colors! Maybe these colors are more typical for end of August or early September, but that is why I love them all the more for January. The painting by Egon Schiele is a departure from his most famous works which typically include figures and nudes. This Field of Flowers is just bursting forth with a liveliness that January desperately needs. 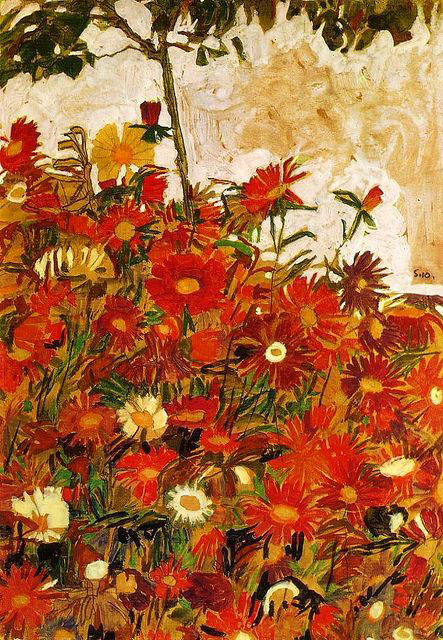 There is a child-like exuberance in this painting with the simple brush strokes for each petal. I love the tapestry quality of this mass of flowers. The petals almost look as if they could be stitched. (Wouldn't this make a gorgeous quilt?) I can almost feel the heat on the back of my neck and the bees buzzing lazily around the blooms. There are a lot of colors to work with in this painting. The varying shades of burgundy to pumpkin to ocher to cream is complemented by the various shades of green in the stems and the leaves. You can stay with the analogous warm tones and then add in the complementary color of green from the other side of the wheel. And if orange is your nemesis (as it was mine a few years ago), this is the perfect time to give it a shot! Make it the star! That is the only way that I know to make it my own. Adding little pops of lighter or darker values allows texture to play an important role in whatever you create. For this month's component I decided to turn my focus to the flower shapes. Last month I started working again in micro mosaics for a new gallery exhibit. Using up all those bits and pieces I have amassed has given me a new focus and helped me breathe new life into all of my work, not just jewelry. I knew this would be the perfect technique to use. While not necessarily a new-to-me technique, usually I make micro-mosaics very flat. This one I wanted to be dimensional. So that in itself was the challenge. I had sold kits for a bracelet design I did that was in a magazine a few years back and ended up with a lot of these bright marquise shaped epoxy resin components left over. I realized they would make the perfect daisy petals. So I came up with a design that would allow me to use them in different color combinations for a charming little pendant that is practically bursting with life. This posy is sure to make you smile! It seemed to me that this field of flowers that Egon came upon was likely just a bunch of wildflowers. I like the idea of wildflowers as "growing freely". That means they are hardy and sturdy and able to withstand the elements. If I learned only one thing from this past year it is that we all need to be hardy and sturdy and able to withstand the elements. We are stronger together and all our colors blend for a more beautiful vista. I want to be just like this wildflower. So I named these pendants Growing Free. And something else I want to do in the new year... as well as creating the components, I want to make sure that I save one for myself to make something. More often than not I give them all away! I made mine just a bit more bling-y with a different center to the flower. 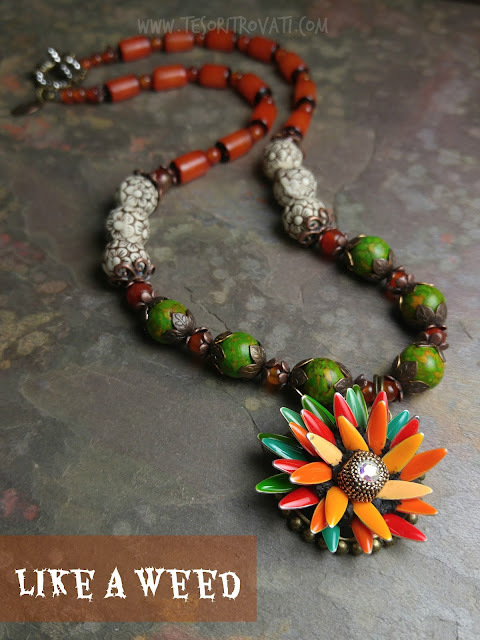 To complement the colors of the bloom, I did a color-block sort of pattern with dyed gaspeite magnesite, carnelian, resin flower rounds and dyed buri seed tubes. I call this necklace Like a Weed. I am looking forward to seeing your Field of Flowers inspired by this painting! I love your wildflower and the necklace you created for it. Absolutely stunning Necklace, loved the post, thanks for sharing. Your wildflowers are so very lovely!! How clever! I thought those were Czech glass daggers at first. How clever. Your creations and words are always inspiring.